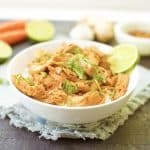 This classic creamy Indian dish if full of flavor and spice, and can be made in your slow cooker or Instant Pot!! Only 10 minutes of prep time is required for this super simple weeknight dinner that is sure to be a crowd pleaser. *Post has been updated with new photos, same great recipe!!!! I am not sure how many of you have an Instant Pot, but if you haven’t quite jumped on that bandwagon yet, let me just introduce you. You know how much I LOVE my slow cooker. Well……….If I’m being totally honest, the Instant Pot might be even more awesome! It cooks meals with the same taste and texture of the slow cooker, but it can cook in the shortest time EVER. Like take this Tikka Masala for example. It took me 20 minutes from start to finish! WHAT?!?! Pretty crazy I know. Now listen, I am not ditching my slow cooker ever because they do have different functions and the slow cooker will be a better option for me sometimes. I just wanted to make sure that I keep you in the loop and in the know for all things cool in life. Now let’s talk Chicken Tikka Masala. This bright and flavorful dish was whipped up on a busy school night last week. 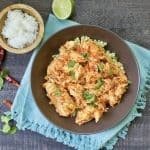 Full of flavor and spice (but not spicy), a little creamy texture with the coconut milk, and just downright delicious! My family loves Indian food; it’s a close second place for me right behind my beloved Mexican. This dish is definitely one that I will make often because we all loved it! It works perfectly over rice or cauliflower rice, with salad, or naan. I top with some fresh basil or cilantro to give the dish an nutritional punch, but also balance out the bold flavor. Below I’ve given directions for BOTH the instant pot and slow cooker. I’ve tried them both and love it equally. It really just depends on time constraints. If you are working all day and don’t have time to program a slow cooker, the Instant Pot may be a great solution for you. 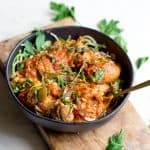 If you have a very busy afternoon and want dinner done when you arrive home, the slow cooker option is probably better. Mix together onion, ginger, and garlic with tomatoes in a small bowl. Add in all the spices and continue to whisk until well blended. Place on the bottom of the slow cooker, add chicken on the top, then chicken broth. Set the slow cooker to low, and cook for 4 hours. Once cooking is complete, add in 1/2 cup coconut milk. Remove chicken for a minute to shred or cut, and place back into slow cooker. If mixture is too watery, add in arrowroot starch to lemon juice. Add to slow cooker for an extra 10-15 minutes and mixture thickens. If not using arrowroot starch, add the lemon juice and serve immediately with fresh basil or cilantro. Season with salt. Select saute on your instant pot and turn to high heat. Once pot is hot add olive oil, ginger, onion, and garlic. Cook for 3-4 minutes stirring until onion is translucent. Select cancel, and add all the spices to the onion mixture scraping the bottom to form a paste. Add the tomatoes, stir, then nestle the chicken on top. Pour chicken broth on top. Secure the lid. Select manual and cook on high pressure for 7 minutes. Once cooking is complete, use a quick release. Remove the lid and chop chicken (a fork is fine since it will be nice and tender). Place chicken back into the Instant Pot. Select saute, and simmer for another 4-5 minutes. Add in coconut milk. If mixture is too thin, add in arrowroot starch to the lemon juice, then pour into mixture. Season with salt as needed, and once mixture is thick, serve immediately with fresh basil or cilantro. *RECIPE UPDATE!! I make this recipe often and have added in an additional tsp of garam masala, because I think it enhances the flavor of the dish. Oh neat! So easy and fast in the IP! I can’t wait to try this! Can you taste the coconut milk in this disk? If so, is there something that can be used as a substitute for coconut milk? I don’t generally like coconut flavors in anything! Hi Tini! I think the coconut flavor is almost undetected because of the spices and tomatoes, it’s more to give it a “creamy” taste. I also love to use coconut milk as a replacement for dairy products like heavy cream, but if you don’t follow a dairy-free diet, go ahead and use 1/2 cup plain greek yogurt or half and half. Thanks for the mods, Hopefully I get to try this over the weekend! Coconut milk doesn’t taste like coconut. Oh yum, love Tikka Masala and I love using my pressure cooker. Thank you for including those cooking instructions. 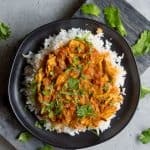 Tikka Masala is one of my favorite dishes and I always love trying out new recipes so I can’t wait to try this one out! I LOVE tikka masala. This looks so good and so easy. I have to try it! This looks so delicious! I love all of those beautiful flavors, especially the ginger and the garam masala – one of my favorites! 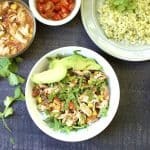 I love slow cooker and instant duo recipes ! It just made life so much easier ! Tikka masala is such a great comfort food. Thanks for sharing this wonderful recipe ! This is one more delicious reason I should get an instant pot! 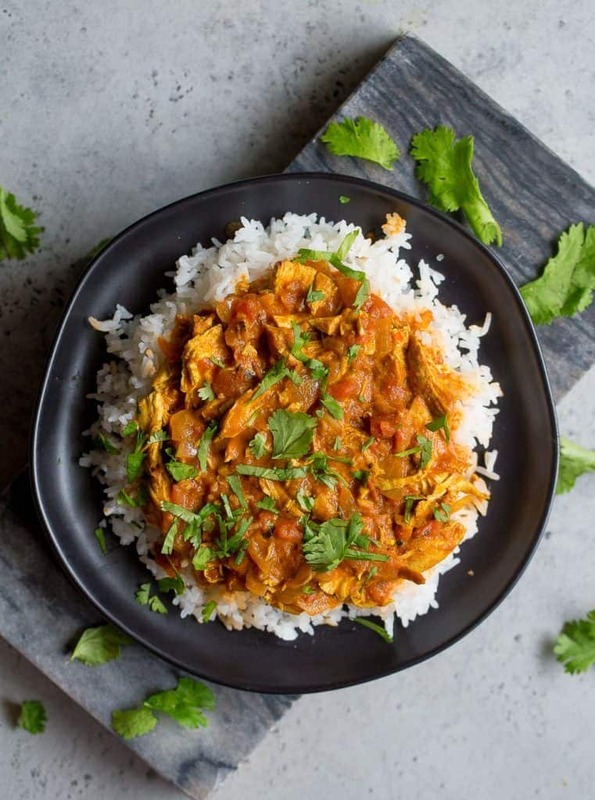 I love tikka masala, and I really want to make this one. I have never made it myself before. I was just thinking about how I wanted to make chicken tikka masala in my IP! Can’t wait to try this. This looks so good and flavorful! My husband always wants big, bold flavor so I think he’ll love this! 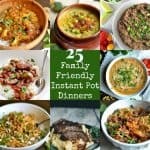 Some more Instant Pot love for my heart and soul! This is comfort food for the soul. I’m always looking for interesting slow cooker recipes, so I can’t wait to try this one out! Have you made this with chicken thighs? Any modifications if so? This sounds delish! Hi Madeline, this will definitely work with chicken thighs! I would use boneless and the chicken should pull apart really easily 🙂 Hope you enjoy! Looks great! Will the instant pot come to pressure with only the 1/2 cup of broth? I thought at least 1 cup of liquid was necessary? I just want to make sure, thank you! Hey Dan, good question! It works out great because of the juice from the canned tomatoes. Hope you enjoy! I forgot the chicken broth when pressure cooking and added it during the final sauté and it still turned out delicious! So glad you love it Kali! Hi I tried following your instructions for the instant pot, but it really didn’t turn out anything like a restaurant tikka masala. It didn’t cook down enough, there were still chunks of tomatoes and not one creamy sauce. Maybe I’ll have to try the slow cook method, but unfortunately there was no instant pot short cut for me. Hi Kevin, sorry it didn’t turn out. If you are using diced tomatoes, you will have chunks of tomatoes (they don’t get broken down by an IP or slow cooker). You can add in extra coconut milk if you want a creamier taste. Also, additional arrowroot starch helps to thicken. I cooked up your recipe in my crocky using turkey breast. Turned out soooo nice, I just love masala and all the spices of the Indian kitchen. Thanks so much for sharing. Yes, I would increase by two minutes. Let me know how it turns out! Thank you! The chicken breasts were frozen in a large lump, so it took an additional 6 minutes, (then checking), then after separating the chicken breasts another 7 minutes. This was delicious – thank you so much for an outstanding recipe! I made this last night, the lemon overpowered the whole dish. I was really disappointed. I think this would have been great without the lemon. 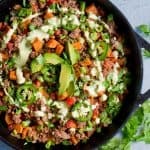 If I would double the recipe in the Instant Pot, how much more (if any) cooking time should I do? Sorry for the late response, Lara! No need to change cooking times! I just finished making this in my instant pot. I found it to be bland and thin even with the arrowroot and extra spoon of marsala. Sad day. Hi! I am brand new to IP cooking – like I’ve-ordered-it-but-haven’t-received-it-yet new – so this may be a newbie question. Do I not cook/brown/sear the chicken before it’s added to the IP with the tomatoes? Thanks! 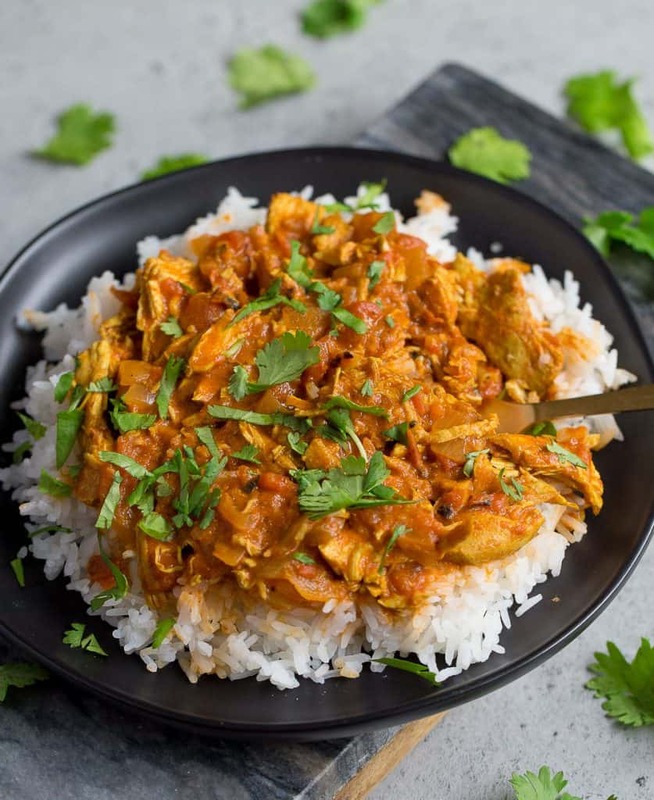 I can’t wait to try your recipe – Tikka Masala is one of the main reasons we’re getting an IP!! Hi Paige! Not a newbie question. So yes, you can sear the chicken if you want, but you don’t need to in this recipe. The chicken will have a slow cooker like consistency without the searing (like you’ll be able to shred with a few forks). But you can absolutely sear with the onion if you’d like! I added salt (probably a couple teaspoons) and only did 1/2 tsp of cayenne for a little less kick and it was perfection! I also added cauliflower rice and spinach to the IP after the chicken cooked and sautéed for an additional few minutes. Turned out exactly as I had hoped. Unfortunately this recipe didn’t quite turn out right. I followed to a T, but I thought the finished product was a little bland. It resembled restaurant chicken tikka masala, but fell short. I added salt and more garam masala after it was all done, but still not a fan. Does the brand of garam masala make a difference? Maybe I just don’t like the brand that I bought? Thanks for your comments, they are helpful. To answer your question, I definitely think the brand of garam masala makes a difference. I make it using Primal Palate’s Garam Masala (which is amazing), and I can taste a more bold flavor. With another brand, I had to doctor it up a bit with cilantro and fresh lime juice. I’m making this now. I wonder if a lot of people are finding it bland because store bought chicken had so much liquid in it? I find the chicken I buy from Costco has a lot of liquid in it. Maybe omit the chicken stock? My first instant pot meal and it was a success! Thanks for sharing! Not sure what happened but this burned in my Favor multicooker. Never had a problem with other recipes before. Chicken was salvaged. I made this last night and it was very good. Next time I will add a bit more garam masala and a little bit of cream to be indulgent. 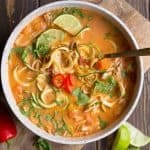 Have you doubled this recipe in the instant pot and if so, how does it change the liquid measurements (chicken stock, coconut milk, etc)? Thanks! Love this recipe and hoping to make it for friends! You can double it. I would keep the chicken broth the same, but double all other ingredients. Can regular cornstarch be used instead of arrowroot starch? I added an extra yogurt cup full of free yogurt, some peas, a spoonful of ghee, and doubled the Garam Masala and cayenne pepper and turned out amazing! This recipe is so good.